Oil on canvas, 57 x 51 cm. With dynamic brush strokes, dimmed lighting and a dramatic composition, Marstrand has depicted the moment of Judas’ betrayal of Christ. 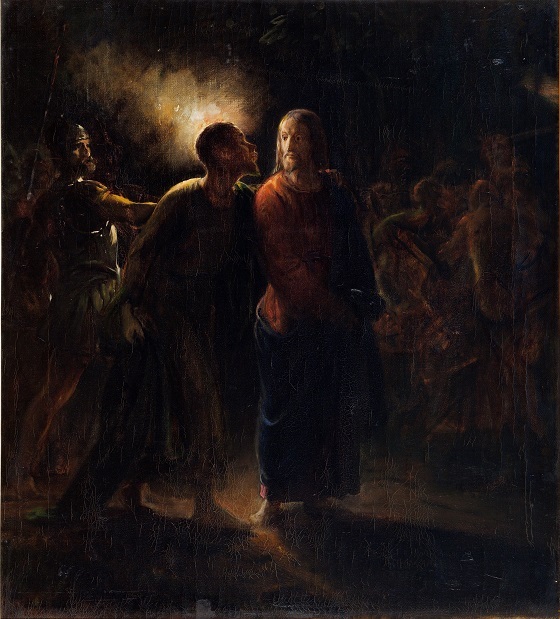 In the Garden of Gethsemane, Judas has just identified Christ to the soldiers by means of a kiss. With weapons and torches in hand, the menacing soldiers have gathered around the company, ready to arrest him. Marstrand has depicted Judas in a stooped posture to emphasise his treasonous but also guilt-inducing act of betrayal. This stands in sharp contrast to the depiction of Christ, who with his straight posture, calm expression and stoicism radiates an acceptance of his ultimate fate. Marstrand amplifies the dramatic nature of this fateful scene by painting the entire composition in a sombre colour palette, only broken by a single light from a torch. The format suggests that the picture is a sketch for an altarpiece.